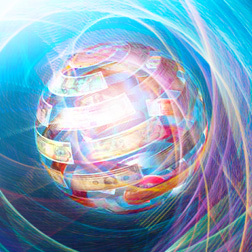 Reinventing Money | Fourth Dimension Inc.
Money is a symbol of wealth and an indispensable resource for the economic and material well-being of our individual and communal life. In the Indian Sanskrit terminology Wealth is called as Artha which also means, “Instrument.” But for what? In our modern age money has become mostly an instrument of our never ending greed. But ideally, money has to become an instrument for the fulfillment of our evolving needs, legitimate desires and higher aspiration. In other words the true aim or purpose of money is to create a material and economic environment which support our inner growth in consciousness and outer progress in life. Thus, neither greedy consumerism nor ascetic denial is the true attitude to money and wealth. We must understand the true nature of money with a deep insight and based on this understanding, figure-out what is the right use of money which can lead to the enrichment of our human life. The science of economics is supposed to tell us about the nature of money and wealth creation. But modern economics regards money as a purely material force with nothing deeper or higher beyond it. Here comes the importance of deeper insights of Indian seers, especially Sri Aurobindo and The Mother, on the subject. In this deeper perspective Money is in its essence a universal force of life or Nature. The notes and coins we use are only the visible and outer most material expression of a deeper, invisible and universal force of life. If we are able to understand intuitively the nature and law of this universal force behind money, and apply it to our management of money, it may perhaps lead to a more effective and a better utilisation of wealth.